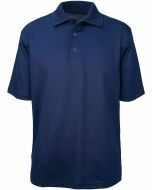 Sleeve 3-Button Polo Shirt, this may be the perfect polo and it is practically maintenance free. It is made of a lightweight poly that breathes, doesn't snag easily, doesn't wrinkle easily, doesn't fade or shrink, and a collar that never curls. Just enough spandex to stretch a little, but not enough to affect the drape of this Made in USA shirt. The no-curl collar offers a very distinctive, upscale look that makes this polo the ultimate in comfort, quality, and style.